Upon first inspection, the document appears to be a photocopy taken from state records and printed on official green paper. However, when the government released PDF is taken into the image editing program Adobe Illustrator, we discover a number of separate elements that reveal the document is not a single scan on paper, as one might surmise. Elements are placed in layers or editing boxes over the scan and green textured paper, which is to say the least unusual. 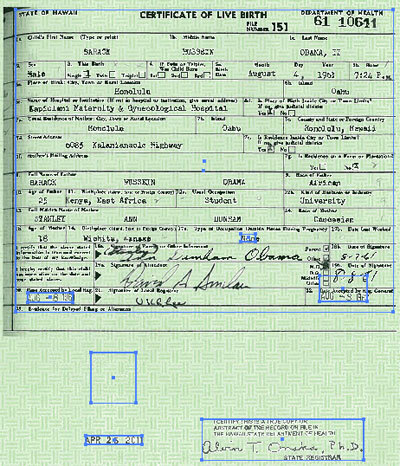 Indeed, but this does not answer the question why in the Obama birth certificate PDF the layers or elements contain dates – which appear to be modified – and the signature of the state registrar. If the document was acquired from state records in whole, why was it necessary to add elements? Goulding and Brooks do not address this issue. Questions have also been raised about the number at the top of the document issued by the Department of Health, number 61 10641, as one part of the number is in a separate layer when viewed in Illustrator, as demonstrated in the video above. This may prove to be significant. A long form birth certificate obtained by the Honolulu Star in 2009 from a female born one day after Obama and whose form was accepted three days after Obama’s document contains a Dept. of Health number that is lower, 61 10637. There are other subtle differences, such as the use of “Aug.” for the date rather than “August,” and the use of “Honolulu, Oahu” rather than “Honolulu, Hawaii” (seen also in the 1962 certificate below) which may or may not be significant.